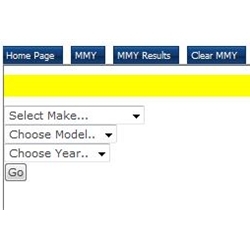 This is an expansion to the Make Model Year Ajax Filters (MMY), providing the ability to use MMY filtering when completing a phone order entry. This is an expansion to the Make Model Year Ajax Filters (MMY). This add-on integrates the MMY filtering capability with phone order entries. Requires and includes installation. Filter product results based on a specific make, model, and year from your phone order entry form. Includes three navigation buttons: MMY, MMY Results, and Clear MMY. - Requires Make Model Year AJAX Filters (MMY) add-on. - Requires and includes installation.